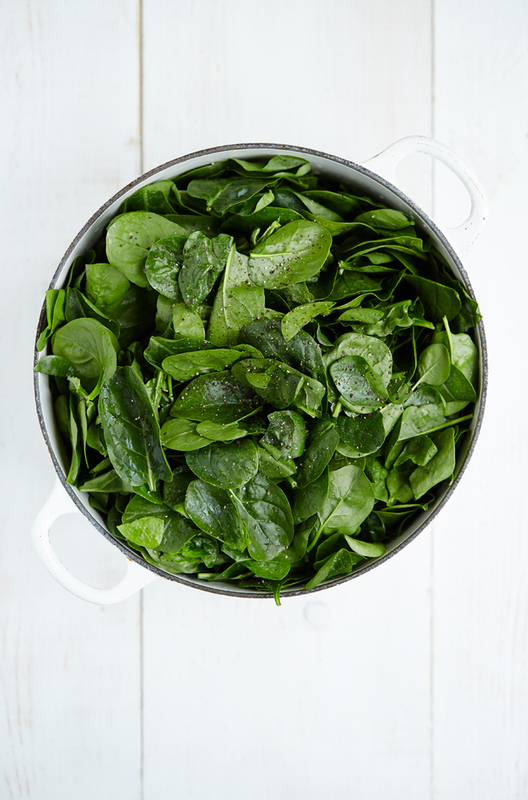 Place the spinach in a large casserole dish or sauté pan and season with salt and pepper. Wilt over a medium heat for 5 or so minutes and then transfer to a salad spinner or colander pressing with the back of a wooden spoon to release the excess water. Preheat the oven to 180c or gas mark 5 and grease a 9in/ 23cm springform cake tin with some of the melted butter. 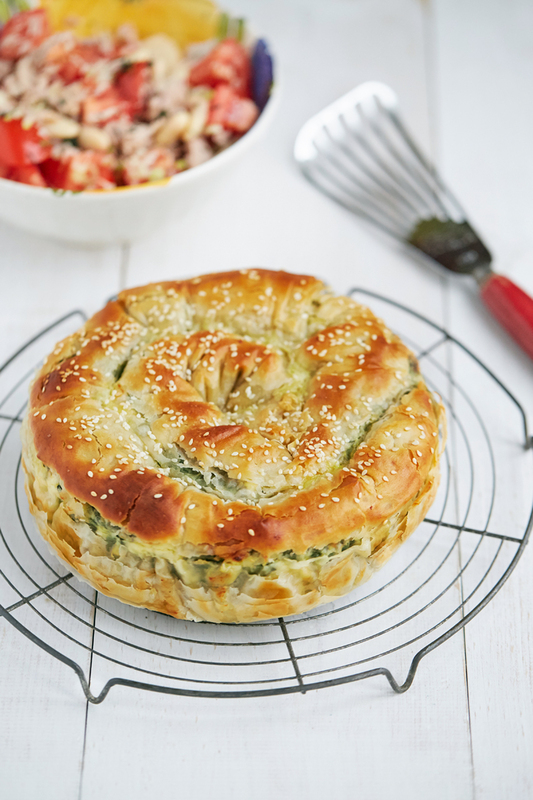 In a large mixing bowl combine the spinach, feta, ricotta, eggs, pepper and herbs. For the pastry, cover your work surface with cling film or baking parchment twice as wide as length of the filo sheets . Lie two sheets of the filo next to each other, overlapping by 3-4 cm on the short sides and brush liberally with melted butter. Layer two more sheets of filo on top of the first two, butter again then layer the last two sheets on top and butter this layer too. Spread the spinach and cheese mixture along the long edge of filo nearest to you and using the cling film or parchment, roll the filling in the pastry away from you by lifting and rolling until you are left with a long sausage. Starting from the outside of the cake tin, coil the sausage into the middle of the tin. Brush again with melted butter then sprinkle over the sesame seeds. Place the cake tin on a baking tray and then bake in the oven until golden brown for 30-45 minutes. Remove from the oven and leave to cool slightly for 10 minutes before serving. Wow, that looks incredibly yummy! Thanks for sharing! Thanks Gen. It was pretty good!